45 % of State population benefit from 3 to 15 government programmes, costing Rs 2,18,377 crore. TRS Govt welfare schemes Hyderabad: Fact and fiction. These two integral elements of election campaigns usually demonstrate where the truth lies. The current campaign for the upcoming elections to the Telangana Assembly, proves that fictitious claims by opposition parties that the TRS did nothing for the people do not stand scrutiny when confronted with facts. Evidence and hard numbers point to the fact that the TRS government has extended welfare benefits to nearly every section of the society, and multiple times to boot. The numbers point to the fact that lives of as many as nearly 1.5 crore individuals of the 2.14 crore rural population alone, have been touched in multiple ways, be it direct aid, assistance, or schemes and programmes introduced by the TRS Government. In fact, estimates reveal that each individual in this group, that accounts for about 45 per cent of the State’s population, have benefitted from a minimum of three TRS government programmes and in many cases, the individuals have reaped the benefits of 15 government schemes. This has resulted in economic well-being and improved quality of life of the people. Lakhs of economically challenged families have also benefitted in other multiple ways from other TRS Government programmes. In fact, individual beneficiaries of various government programmes when tallied, total up to a massive 6,92,46,598, which is nearly twice the 3.52 crore population in Telangana. All of this was made possible by the TRS government that has pumped in a whopping Rs 2,18,377 crore into these 40 major schemes and programmes. As per the 2011 Census, Telangana’s population is 3.52 crore. Of this, 2.14 crore are listed as rural with the rest comprising urban and urbanised areas dwellers. One of the single largest communities to have reaped the benefit of TRS government programmes is the 72 lakh-odd farmers. This ground has found that the TRS Government has literally put its money where its mouth is. To begin with, more than half of the farmers, 35,29,944 to be precise, were beneficiaries of the Rs 16,124.37 crore loan waiver that rid the farmers of loan burden of up to Rs 1 lakh each. While the Rs 5,111 crore first-of-its-kind Rythu Bandhu input assistance scheme benefitted 49,49,000 farmers giving a much needed boost of Rs 8,000 a year per acre to meet immediate input costs, another first for farmers in the country, the Rythu Bhima scheme, has guaranteed a much needed financial blanket of Rs 5 lakh in life insurance to families of 28 lakh farmers in Telangana. 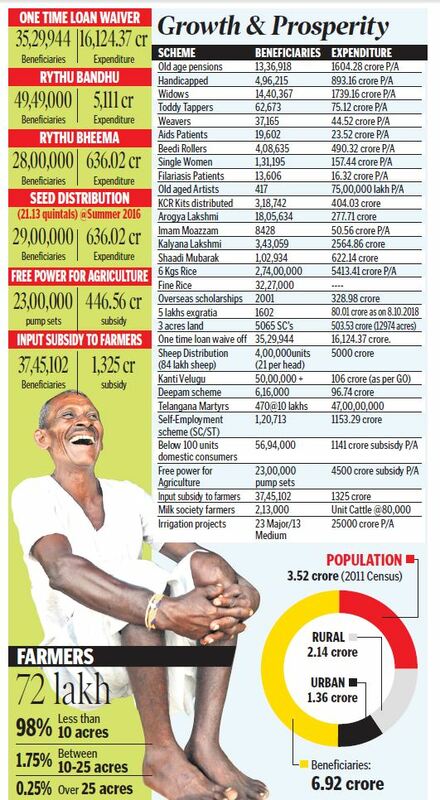 Then there is the subsidised seed distribution at a cost of Rs 446.56 crore that reached 29 lakh farmers. While supply of 24 hour free power supply to farmers in Telangana also became a first in the country directly helping farmers run a whopping 23 lakh agricultural pumpsets with a hitherto unexperienced peace of mind, the TRS government has also spent Rs 1,325 crore on farmers providing other input subsidies. Such subsidies include aid for farm mechanisation, construction of poly houses and installing drip irrigation systems. Such multiple scheme beneficiaries also include those who gained from the sheep distribution scheme with a number of them also holding small agricultural land parcels since many such families received assistance from several other schemes. It is this section of the population who account for about 1.5 crore people in the State, who are expected to stand by the TRS in the coming elections and vote for it.This large number comes from the fact that many government schemes are applicable to different individuals in the families and the families as a whole themselves. For instance, each member of a family from the eligible poor receives 6 kg of rice per month. And such and other eligible families, also have benefited from schemes such as Kalyana Lakshmi, Shaadi Mubaarak, KCR Kits, Arogyasri, Aasara (a bouquet of pension schemes), Mission Bhagiratha drinking water, irrigation water from Mission Kakatiya tanks, pensions for single women and the likes. Incidentally, schemes such as Kanti Velugu, Kalyana Lakshmi, Shaadi Mubaarak, 6 kg rice per person, welfare pensions, scholarships, Deepam and Mission Bhagiratha among others, are as applicable to the urban population as to those living in rural areas demonstrating that TRS Government’s welfare programmes cut across landscapes and demographies.